As our children reach the ages of 3 and 4, the inevitable question that comes is “Have you enrolled them in Junior Kindergarten yet?” Possibly, depending on your situation and the choices of your friends and family, you may have been asked if you were sending your children to nursery school when the little ones were only 2 or 3. The pressure to do so is immense. The standard cultural response is so overwhelmingly in favour of sending our kids to early schooling that any parent may feel the pressure and societal expectation to send them to a brick and mortar school at a very young age without question. But should they? Why wouldn’t they? Of course, they are also quick to point out the academic and social benefits of early education for our children. The research shows that children who are taught their letters and numbers at a young age reach literacy markers earlier and more confidently. But is that an accomplishment that can only be done in a school building? Why can’t a mom teach those skills at home? And how do the schools teach? What primary modes of education do they use? Are they modes that a mom could use at home? On the other hand, what about drawbacks? Are there negative consequences of daycare or early preschool that a mom can avoid for her children by keeping them at home for the early years? First, let’s first look at the benefits of preschool and see if they are attainable at home as well. Moms are often quite intimidated by the thought of teaching their children rigorous academic subjects like physics and foreign language or ancient history, but long before those years, what do they actually learn in preschool? If you are counting stairs as you carry your child up to bed, if you are reading good books and playing with fridge magnet alphabets, if you are singing nursery rhymes and playing patty-cake, if you are discussing which colour shirt your child wants to wear, and whether they need to wear a raincoat or a sweater to play outside, then you are well on your way to teaching preschool. Do you have a dress-up box in your playroom? Do you have crayons and Play-doh and Lego? Do you have nap time and snack time? You are well on your way to teaching preschool. Unfortunately, all is not good news in the research of preschool and early, formal education. Proponents of sending our children to school often speak of what our kids are “missing out on”. Research is beginning to show that not all of what we are ‘missing out on’ is desirable. What is the right choice for your family? Considering the educational and social goals of preschool, and considering the social benefits to preschool, and considering the means through which the schools achieve those goals, do you not see that you could accomplish all of this at home? You certainly are more than adequately skilled to facilitate this kind of learning yourself. Additionally, there are certainly a multitude of resources available to make this fun and easy for you and your child. (4) There are also so many social opportunities for your child through church groups, social clubs, sports teams, and homeschool co-operatives. 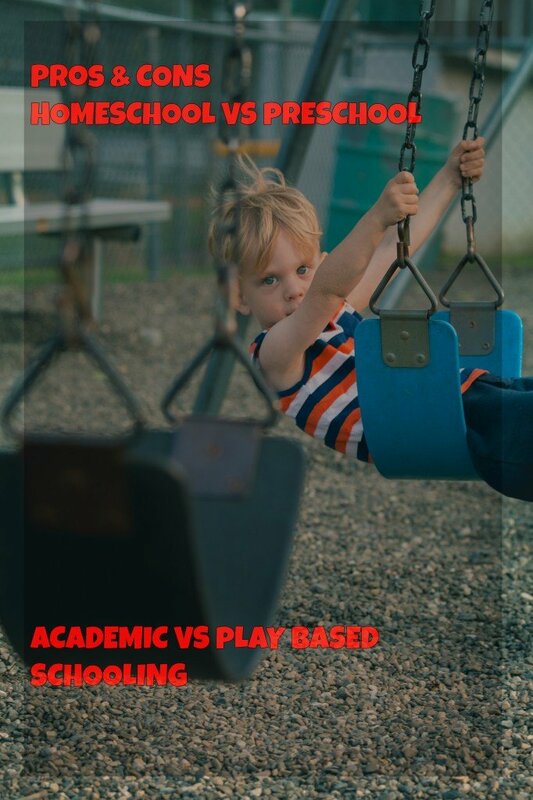 Consider also the potential negative consequences of sending your child to preschool and decide if it is a risk worth taking at their young age.